Lady Eleanor Langston has a problem: her husband Henry, prime-minister-in-the-making, is too caught up in his work to notice her. Despite her involvement in his various public appearances, she feels shut out of his life, especially with their one-year anniversary looming. When Henry hires a highly recommended French lady’s maid without consulting her, Eleanor’s anger can’t be contained—until she meets her. With Babette’s help, Eleanor arms herself with the one weapon that will make Henry notice her as a woman—her inner siren. 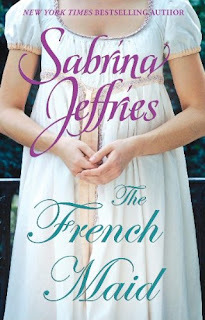 THE FRENCH MAID is a very short (20 pgs on my Nook for PC) story. Despite it's length, I thought it was very sweet and endearing. This was my first foray into historical romance and I enjoyed it. I was shocked, although I'm sure they're not all like this book. I'm certainly more open to reading this genre. The writing was done really well. I was worried that there would be a lot of 'thee' and 'twas' and 'thou' but there was none of that. The behaviorism's were the only thing that gave away the genre and the pet names of course. Overall I was pleasantly surprised by how much I liked this story and look forward to trying other books similar to it. Not on a regular basis, but certainly as an alternative.